ICB Orthotics are designed to be professionally fitted by Podiatrists or similiar Healthcare Specialists. Corrective preform orthoses. Available in both soft and flex (polyproplene) designs. Range of neutral moulded insoles. Cost effective orthotic solution popular with all practitioners. Orthotic solutions and insoles designed specifically for children. Unfinished foot orthotics and insole blanks ready to be bespoke adjusted. Insole additions for chairside and custom orthotic production. Also, silicones and Podotech gels. 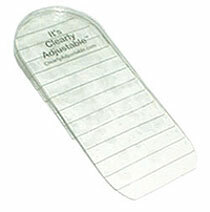 Specially designed for mild pronation, suitable for Diabetics, Geriatrics (including Arthritis sufferers). ICB Mid Density Insoles are specially designed to suit the standard patient who exhibits medium pronation. ICB Firm Density Orthotics are specially designed to treat patients with severe pronation and its effects. The ICB High Heel Orthotic is a mid density EVA, with a black taibrelle top cover. Rearfoot wedging reduces the need for excessive arch height, while maintaining support. Orthotic for use in men and womens dress shoes and sports boots. Lightweight and easy fitting. Sold in pairs.